There’s no wrong time to check out Blue Waters, though you can definitely have a bit more privacy if you shy away from big holidays. If sweeping ocean views and perfectly manicured tropical surroundings is your idea of a vacation look no further than this slice of Caribbean paradise.Blue Waters offers a surprising mix of luxury seclusion and social activities across their 69 rooms & suites, 28 Cove Suites and four unique villas. There’s an amazing sense of community you can experience whether it’s rubbing elbows with other guests at Pelican Bar, Veronica’s or the new Carolyn’s down at the pool bar (tell Carolyn we say “hey”!). Be sure to check out some of the great live music offered each night. Incredible local musicians like Buell: Strings That Sing bring a rich sense of local artistry and local cover and Soca bands stir an already fun atmosphere and entice everyone to get up and dance the night away. Hit the community bookshelf in the hotel lobby and grab a new book to snuggle up with at any of the three secluded beaches overlooking Soldier’s Bay. I nabbed a Bridget Jones and ended up having Caroly make me a special punch for my beach adventure. Be sure to go for a few nice walks and explore the property in its entirety. The adults-only pool is an optimal location to get a bit of sun, but the picturesque old Sugar Mill over by the spa is such a gorgeous spot to watch the sun rise or set. Dinner at the Palm Restaurant is casual and fun but the decadent Cove Restaurant and Bartley’s are rich in luxury and indulgence. Dress up in your best resort look and get ready for an epic romantic feast. Blue Waters is located at Soldier’s Bay, St. John’s on the North Western tip of Antigua west-facing onto the Caribbean Sea, just fifteen minutes from VC Bird International Airport. Antigua is one of the Leeward Islands and the main island of the country Antigua and Barbuda. Close islands include St. Kitts & Nevis, Anguilla, Montserrat, and Guadeloupe. 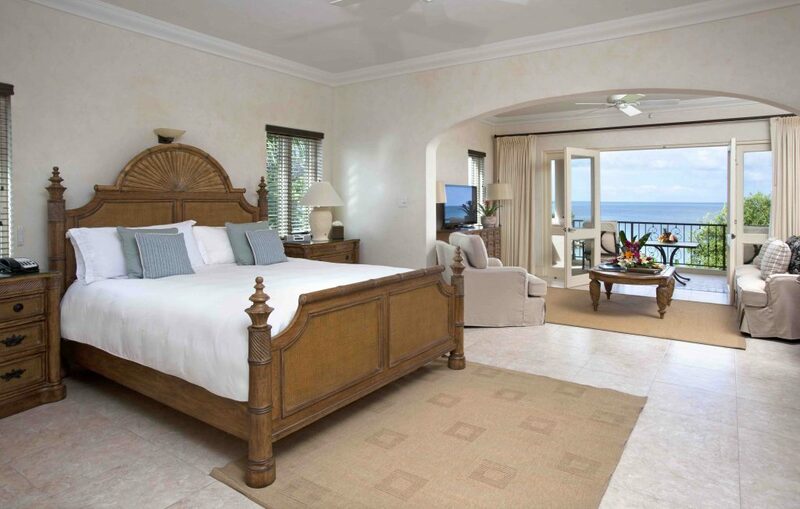 Superior Hillside Guestrooms (roughly 265-322 square feet) redefine tropical luxury with either one king or two twin beds and an en suite bathroom. The swank Caribbean flair features designer beach furniture and textiles, crisp white bedding with accents of cool colors (teals & turquoise) and soft touches reminding you that no, you’re definitely not in Kansas anymore. Each room has air-conditioning & a ceiling fan, complimentary WiFi, complimentary coffee and tea, a flat screen TV, and mini-fridge (stocked to order!) 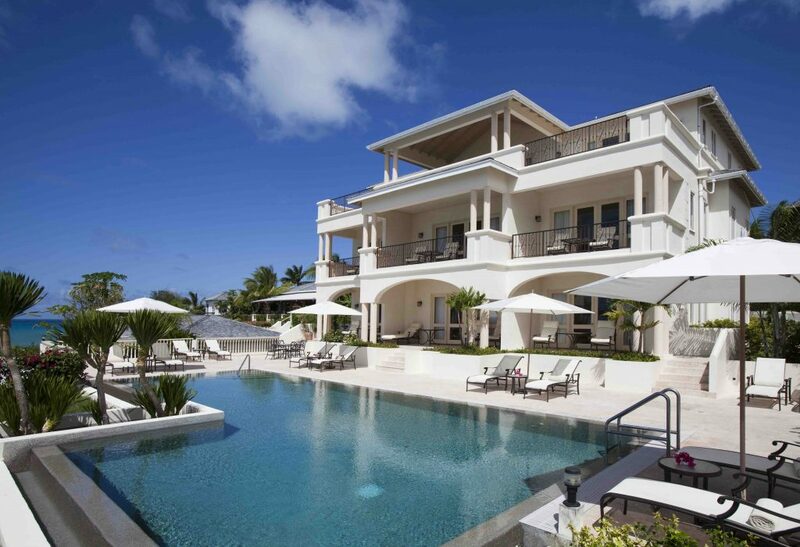 Deluxe Beachfront Rooms kick it up a notch with private pools and ocean views. The suites also offer 302-357 square feet for you to throw on a sarong and twirl as you take in the morning Caribbean air. Leave all the windows open and climb into the bathtub for an incredible soak with the Caribbean breeze swirling around you. Blue Waters offers lux Elemis toiletries, comfortable bathrobes and slippers, and enormous bathrooms with a separate shower and a bath. Things feel brand new everywhere you look. All rooms have ceiling fans and air-conditioning, complimentary WiFi and 110v and 220v outlets, a safe, hair dryer, flat screen TV and mini-fridge (stocked to order if staying All-inclusive). Housekeeping comes twice a day including the evening turn down and there’s always plenty of coffee and tea for your enjoyment.